It’s a great feeling to put your mind to something and then make it happen. Crossing the finish line of any race in life is awesome. For those who are considering their first 5K race: do it. It provides a great opportunity to set a goal, develop a plan, put it into action and get the full reward at the finish line. You can even manage stress and improve your health along the way. For anyone who is new to this or trying it for the first time, I highly recommend the app 5K runner. (This is not a paid endorsement. I am recommending it because I have used it!) Not only can it help a beginner progress safe and efficiently towards completing a 5K, it has some really cool features as well. In the early stages of 5K training for beginners, you will begin with intervals of walking and running to build up endurance. This application allows you to listen to your music while the app is running in the background. You will get audio cues of when to walk and when to run throughout your workout. The onscreen visuals show how long until your interval is done and how long before the next interval will begin as well as your total workout time. Can integrate with social media including linking into a community of runners on Facebook. 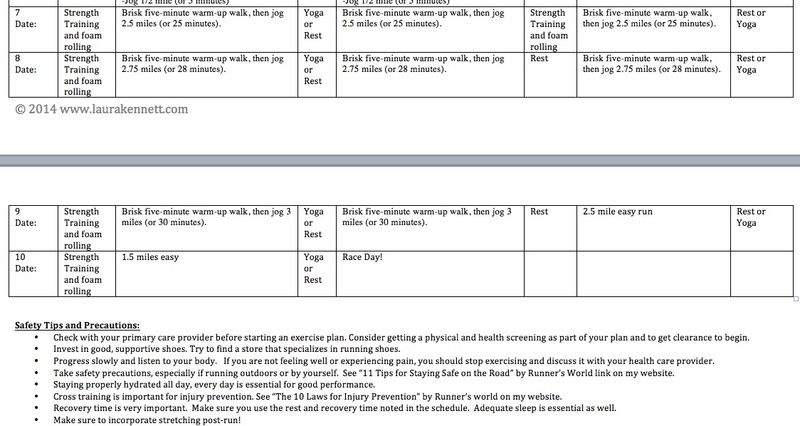 You can also go old-school and use a paper and pencil calendar type training plan. 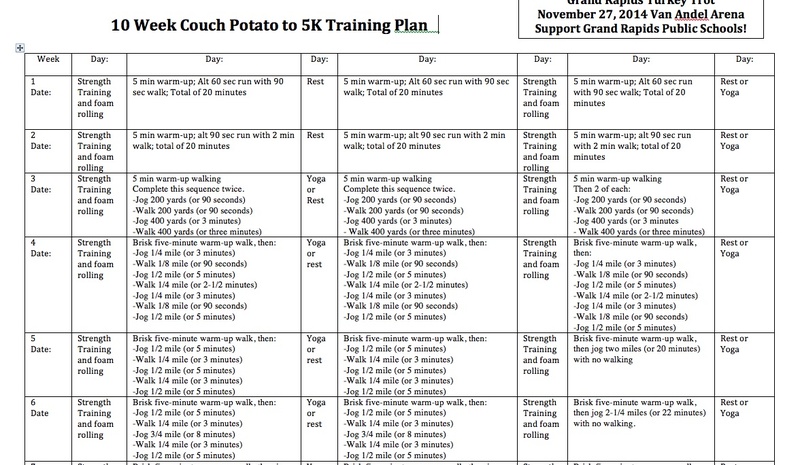 Here is one I made for a Couch Potato to 5K group awhile ago. You can click on the links below to access them. Check with your primary care provider before starting an exercise plan. Consider getting a physical and health screening as part of your plan and to get clearance to begin. Invest in good, supportive shoes. Try to find a store that specializes in running shoes. Progress slowly and listen to your body. If you are not feeling well or experiencing pain, you should stop exercising and discuss it with your health care provider. Take safety precautions, especially if running outdoors or by yourself. See “11 Tips for Staying Safe on the Road” by Runner’s World. Staying properly hydrated all day, every day is essential for good performance. Recovery time is very important. Make sure you use the rest and recovery time noted in the schedule. Adequate sleep is essential as well. Make sure to incorporate stretching post-run!